The two Pioneer Venus spacecraft were designed to be launched by the Atlas-Centaur for the 1978 Venus opportunity. Earlier studies had considered the Thor-Delta launch vehicle, but the Atlas-Centaur was judged by NASA to provide superior science performance and potential cost savings due to the greater payload capability. The starting point for spacecraft design is the allowable mass for the two spacecraft that is determined by the performance of the designated launch vehicle. Our customer, NASA’s Ames Research Center, adopted a specification weight for us to work to allowing for a cushion or contingency below the Atlas-Centaur launch capability. The ARC specification values, as a function of time, are shown in Figures 4-1 and 4-2 for the Orbiter and Multiprobe spacecrafts. The 1978 Venus launch opportunity can be divided into two phases. The earlier launch opportunity, late May-early June, has a greater flight time to Venus and is a Type II interplanetary trajectory traversing an arc of more than 180O about the sun. However, this launch requires greater launch vehicle performance and provide less payload capability. The later launches in August, use a Type I interplanetary trajectory (less than 180O solar arc) and provide more than a 50% greater payload capability. As neither Hughes nor NASA Ames could support two simultaneous launch campaigns the Orbiter and Multiprobe require using both the early and late launch opportunities for the 1978 Venus opportunity. 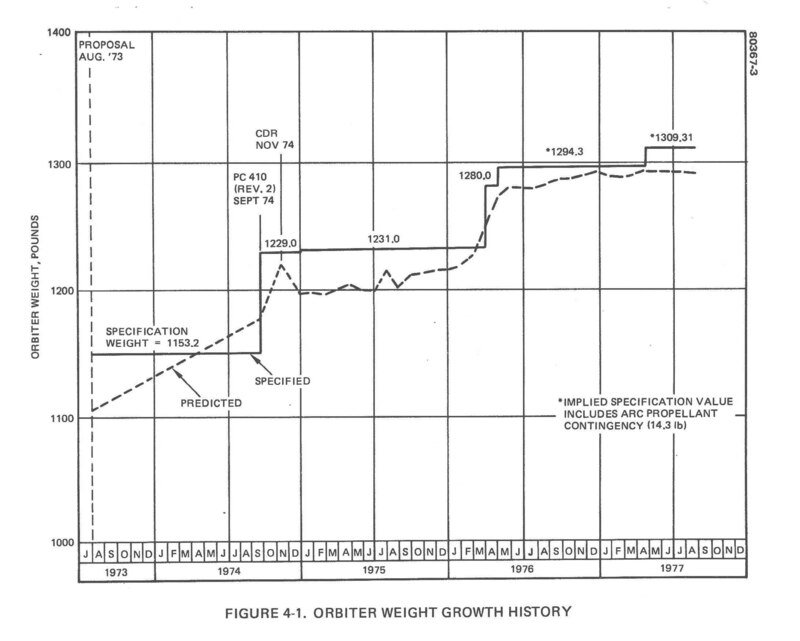 The Orbiter weight was significantly less than the Multiprobe and could launched during the earlier opportunity. An advantage is the 60% lower ∆V required for orbit insertion at Venus. The August launch opportunity is then available for the 60% heavier Multiprobe. 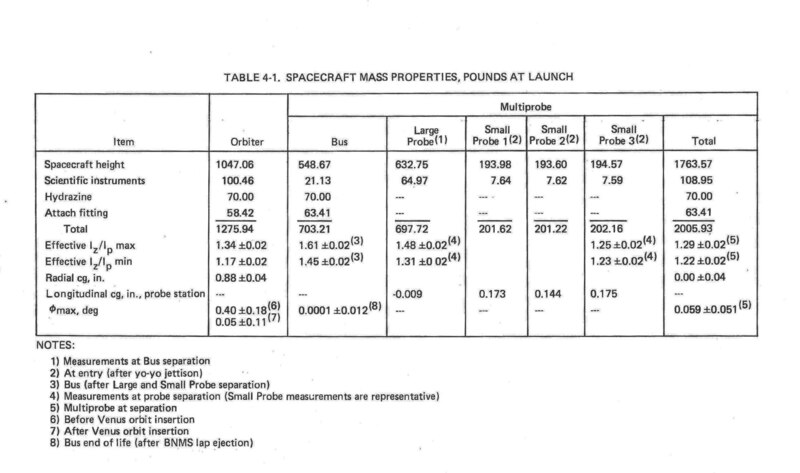 The final mass properties measurements for the two spacecraft are shown in Table 4-1 from the Reference 1. Note that the first row in the Table which is labeled “Spacecraft height” should read “Spacecraft weight.” Both spacecraft are stable spinners based upon the HS-333 design. Joe Lotta was responsible for the Pioneer Venus mass properties analyses. This involved collecting inputs from each design area on a monthly basis and calculating the overall mass properties for each spacecraft. As shown in Figures 4-1 and 4-2 from Reference 1, over the course of the nearly four-year program weight growth was a constant concern. Considerable effort was devoted to trying to control weight growth and finding weight savings. At every opportunity trade-offs were considered and lists of weight savings with the cost detailed for each saving would be considered. Those weight savings characterized by lower dollars per pound would be implemented. Reference 1 documents 90 pounds of savings implemented for the Orbiter and 105 pounds for the Multiprobe. 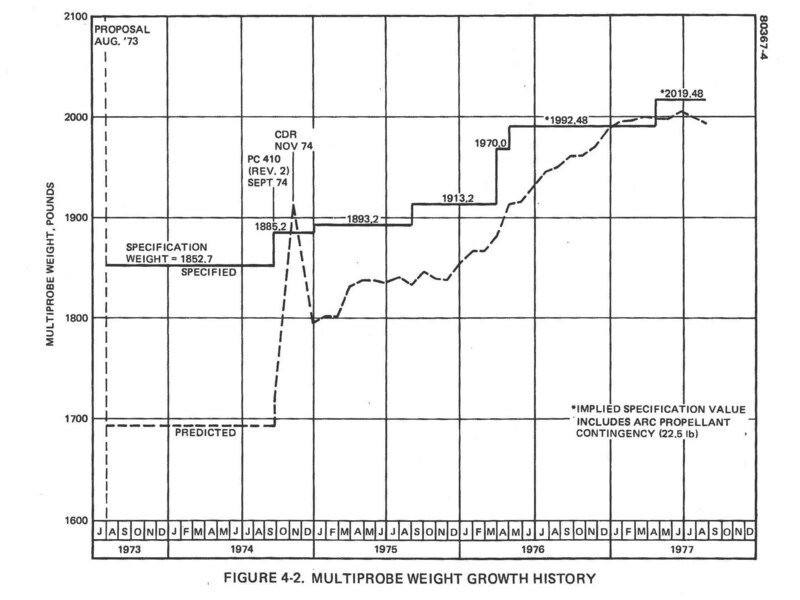 NASA ARC was able to provide increases in their specification weights to accommodate our weight growth. Some must have been due to Atlas Centaur performance improvements and the rest due to reduced contingencies and weight reserves. In retrospect it all came together and we witnessed two very successful missions. Reference 1. Pioneer Venus Final Project Report. HS507-7970. December 1978, Bernard J. Bienstock. Great info Jack. Any current info on Joe Lotta?